Quick! Nip out and buy the ingredients! You still have time! 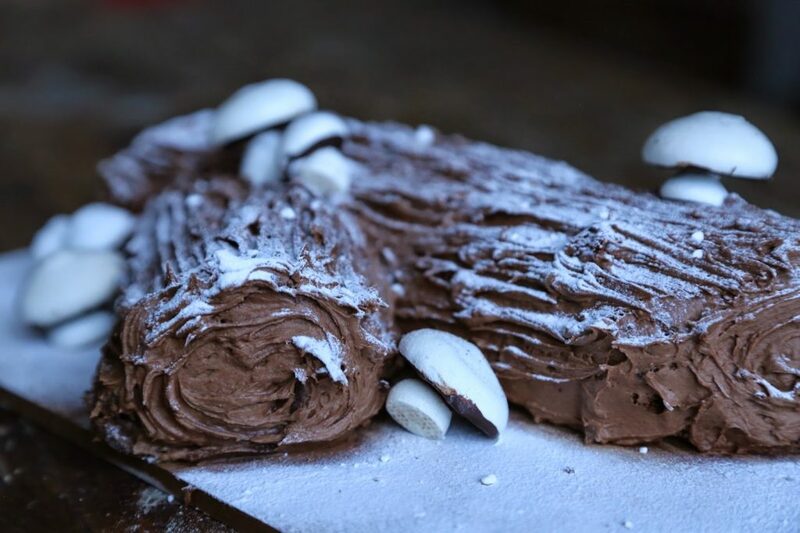 I much prefer a chocolate cake to a Christmas pudding and this yule log is effectively just that. But with nutella icing and a chestnut purée filling. This is incredibly indulgent. 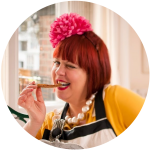 The magic mushroom recipe is in my new book MsMarmitelover’s Secret Tea Party which you can order here. You will need a flat baking tray or a Swiss roll baking tin, some parchment paper and a rectangular cake board long enough to fit the cake. In a clean dry bowl (of a stand mixer) whisk the egg whites until frothy. In another bowl whisk the egg yolks with the caster sugar until pale then add the cocoa powder, salt and vanilla paste. Fold the egg whites into the yolk/cocoa powder mixture, taking care not to crush the air out of the mixture. Pour it into a baking tin which is lined with parchment paper, which should overlap over the sides. You will be using this paper to help roll the cake into a Swiss roll. Dust another sheet of parchment paper with icing sugar. 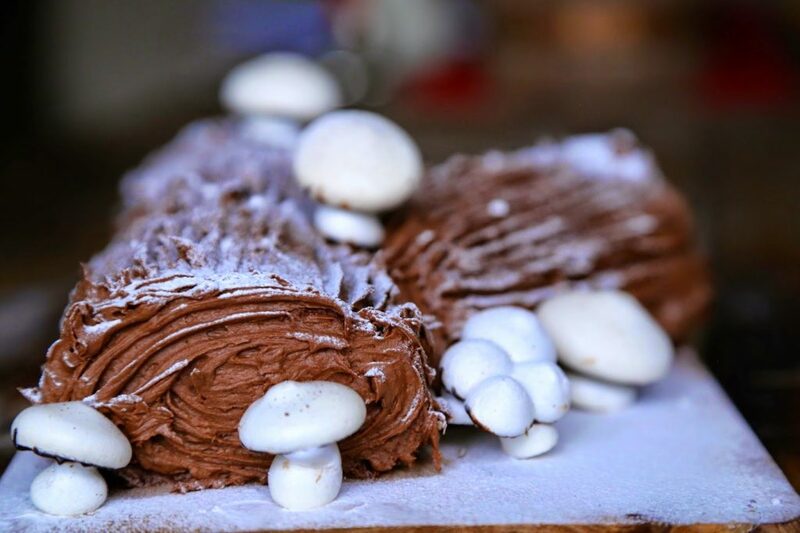 Flip the piece of parchment paper containing the baked Swiss roll over onto the prepared paper with the icing sugar. Leave while you prepare the filling. For the filling mix all the ingredients together in a bowl.. You can melt the chocolate in 15 second increments in the microwave. Take care not to burn the chocolate. Then uncover the Swiss roll and spread the filling thinly all over the cake right up to the edges. Using the paper, roll up the cake (obviously the long side) until it forms a tightish roll. Place it on a cake board. Then cut off a quarter of the roll at an angle. Place this little section next to the larger section of cake, the diagonal side attaching to the side, a little way up the ‘trunk’ of the log. This will be an offshoot branch. 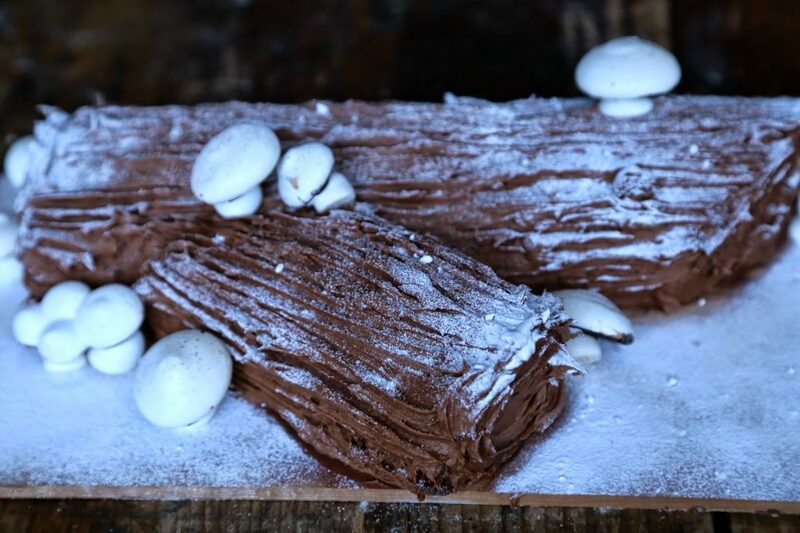 Mix all the ingredients together and with a rubber spatula, cover the entirety of the chocolate log, covering over the join of the two branches, making sure you cover the ends also. Drag a fork along it lengthways to create a wood grain and swirl your fork around for the ‘ends’. Dust the buche de noel with icing sugar in a tea strainer or small sieve. Then dot the little mushrooms around and decorate with a sprig of holly. This is kind of cake I like the most, chocolate cakes are the best! Did you make the mushroom meringues or were they bought? ?